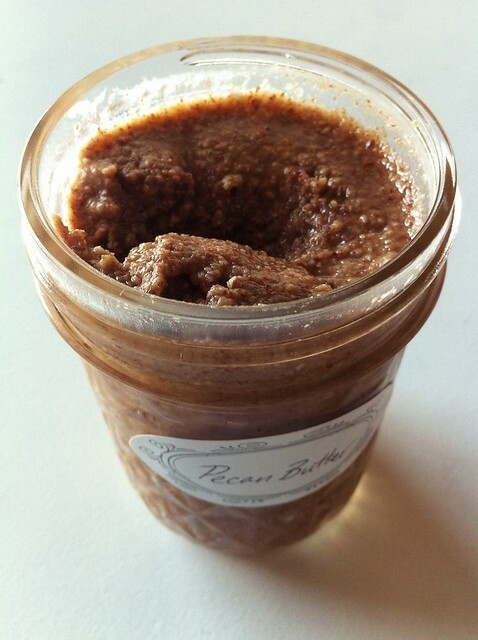 I was inspired by this post over at Cookie + Kate via TheKitchn to whip up some pecan butter. So, I did! The only change I made was to use raw pecans. I skipped the toasting. While I’m sure this seriously added to the deliciousness, I’m trying to eat a high raw diet. Also, I could have processed mine longer, but I was impatient! Process longer for an even creamier texture. 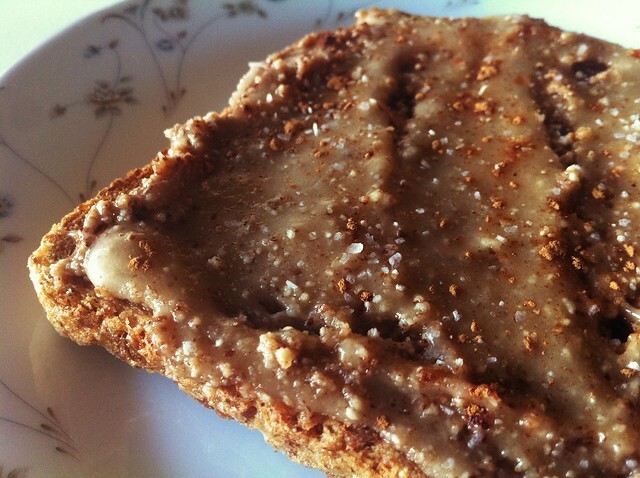 I chose to enjoy mine on a slice of toasted Ezekiel bread with some raw honey and a sprinkling of sea salt and cinnamon. Delish! Eight ounces of nuts produced one jelly jar of pecan butter. Store in the fridge. I imagine it’s best to use this up within a week. Homemade nut butter would make a great last minute hostess gift! It literally took me all of ten minutes to make. Can’t wait to try more varieties of nut butters. Enjoy! How to Make Pecan Butter from Cookie + Kate. I’ve been very curious about this vegetable I’d been seeing at my local Farmers Market. What was it? It looked almost medieval. What would it taste like? How would one prepare it? I’m always up for trying new vegetables. Generally, I try them raw, first. Then, I roast simply with olive oil, salt and pepper. I love roasted cauliflower. This reminded me of cauliflower. 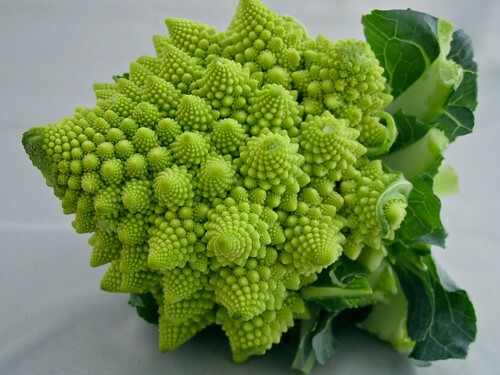 So, I finally decided to purchase a small romanesco broccoli to sample. I plan to eat this in the next few days. I’ll report back my findings! 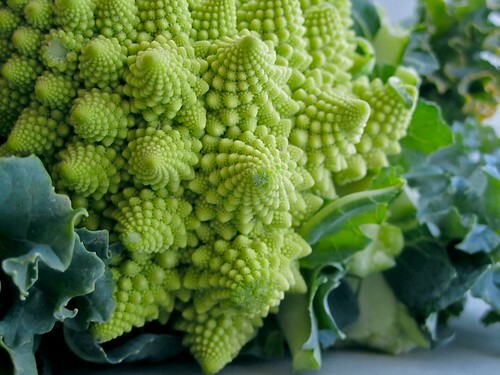 Apparently, this vegetable was first documented in Italy in the sixteenth century, and it’s a variant of cauliflower. Much prettier than your run of the mill white variety that you normally consume. 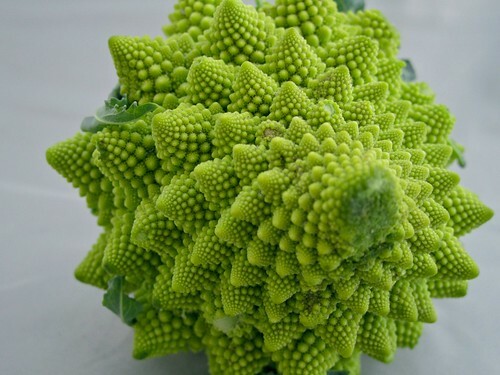 It is such a neat example of a fractal in nature. Very inspiring! Have you had this yet? If so, how did you prepare it? I’d love to hear about your ideas, too, on preparing this wonderfully unique vegetable. I recently discovered the tartine while reading Dorie Greenspan’s new book, Around My French Table. After reading that it’s a nicely toasted slice of country bread topped with essentially whatever you’d like, I’ve become completely hooked on trying new variations! My first tartine was this one I posted a few days ago. That same evening I made another tartine for dinner. 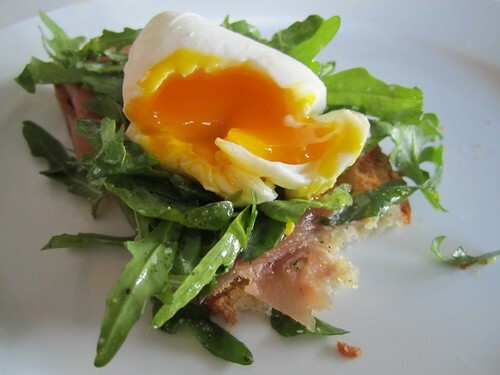 This time featuring peppery arugula, salty prosciutto and a creamy poached egg. I’d eaten poached eggs, but never have I attempted to make one at home. I’ll admit. 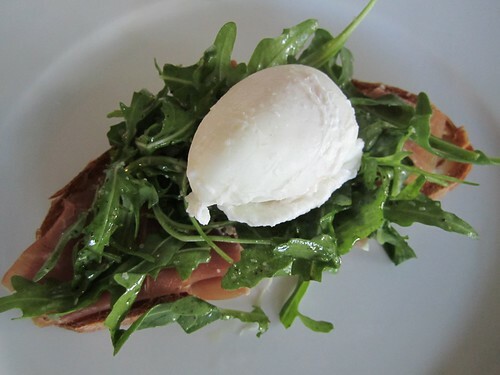 I was pretty intimidated.While I don’t know if this is a perfect poached egg, I do know that it was fantastic and creamy and worked beautifully when paired with the prosciutto and arugula. 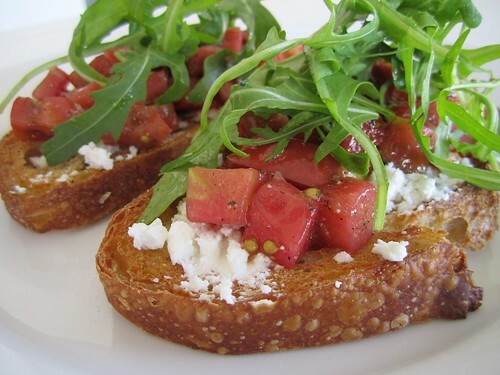 If you want to make this at home, simply toast one side of a 1/4 inch slice of country bread. Top with 1/2 an ounce of prosciutto, a handful of arugula. I tossed mine in a little extra virgin olive oil and a dash of black truffle oil in a bowl prior to plating. I would prep all of this before you start poaching your egg. It will be a lovely little bed of goodness waiting for your perfectly (or near perfectly) poached egg! 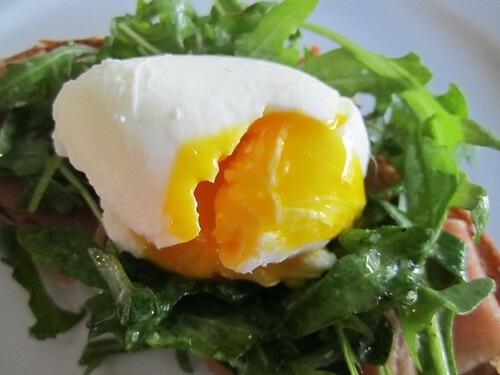 Want to poach an egg? Try these resources. How to Poach an Egg from Serious Eats. Poach an Egg from CHOW. Easy Poached Eggs from Simply Recipes. Be brave!!. Worst case, it will not cook properly and you can simple fry up an egg instead. It would still be a lovely combination. Recently, I decided it was finally time to start delving into home preserving. I’ve always been intrigued by it, but also pretty intimidated! Why? I don’t know. Seems more complicated than it really is. I’ve been researching quite a bit, and reading a few books including Well-Preserved, which I highly recommend. She is so informative, and all the recipes sound so wonderful. She offers a handful of recipes utilizing the items you’ve preserved. I find that so helpful! We started with pickled hot peppers. (This is not a recipe in the book.) I had made these before using this Bon Apetit recipe. However, I did not process them for long term storage. I only made one jar, and we ate them all in a matter of days! Figured this would be an easy one to start with, using this recipe as a guide. Try them. Even if you don’t process in a water bath. You can make them and store in a jar in your fridge. So tasty. Great addition to sandwiches, and great for anyone who likes heat! Next time I will pack the jars more. I was hesitant to overfill then, but I definitely could have added more. Drat! 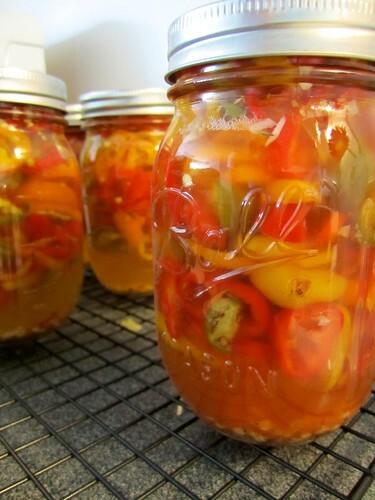 ***HOT TIP*** You may have leftover brine and peppers. Make a salsa! We added a dash of sriracha hot sauce and sweet chili sauce to the brine before pouring into the blender. Add a big handful of peppers, some tomatoes, lime juice and cilantro and blend away! This was one of the best salsas we’ve ever made…. ever! My husband is still talking about it. Simple. Fresh. Delicious. Try this with your local farmers market produce! A variety of toppings would be wonderful! Play with your combinations. 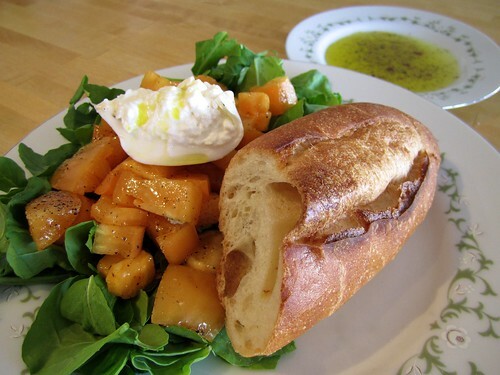 Can you imagine lovely, fall butternut squash in place of the tomatoes?! Drizzle your bread slices with a little olive oil and toast under broiler (or toaster oven) only on one side. While bread is toasting, season your tomatoes with a little salt and pepper. Toss and allow flavors to develop. 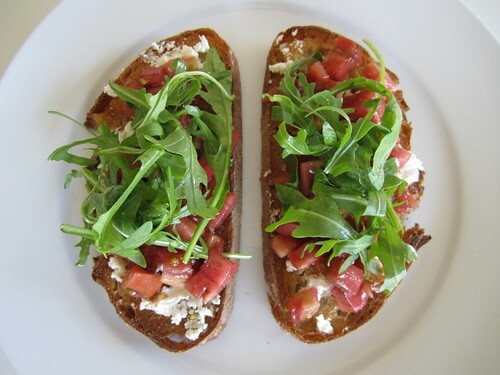 Toss your arugula with a tiny bit of the extra virgin olive oil, just to barely coat. Remove bread from oven. Divide goat chevre between the two slices and spread. Top with tomatoes and a little of the juices from bottom of the bowl. Drizzle a little extra virgin olive oil over the tomatoes. 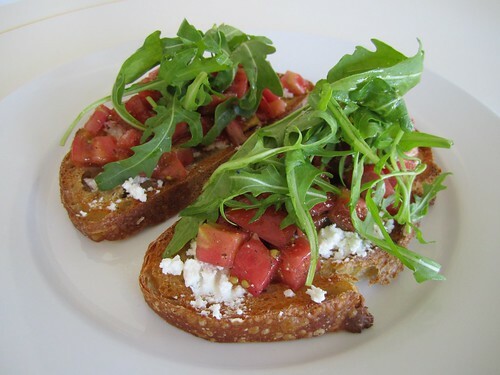 Top with arugula and enjoy with an icy, cold glass of sweet tea. Served in a mason jar, of course! This was such a simple and deliciously satisfying light lunch. I just adore simple, fresh flavors without a lot of fuss. Allow your local produce to really shine! Always so much more flavorful than store bought produce from who knows where. If you haven’t tried out your local market yet, I encourage you to do so. You won’t regret it! This weekend I bought some figs at the Farmers Market, but they were quickly heading towards the grave. Knowing we wouldn’t eat all of them before they went bad, I thought: JAM! Typically, you want to use your best fruits for making jam, but I figured I needed to whip up a small batch that I’d use over the course of this week. 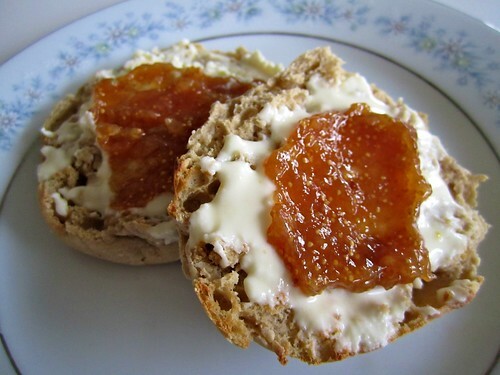 This was such a simple quick jam to make, and it pairs beautifully with this local lemon quark on a warm toasty english muffin. Simply combine all ingredients over medium high heat. Bring to a boil then reduce to a simmer until thick. Consistency is up to your preferences. Once ready, transfer to a pretty jar, and allow to cool before refrigerating. Again, I paired mine with a local lemon quark from Spring Hill Cheese Co. Quark is lower in fat and calories than most cheese and so rich in flavor. It’s a German style cream cheese. This lemon flavor tastes like dessert on it’s own! But, add the jam and whoa! So good. I recently discovered burrata cheese, and have come to really enjoy it! And, since I had some on hand, I was inspired to update my favorite lunch salad after reading this post from TheKitchn earlier today. It was a lovely addition to the salad. 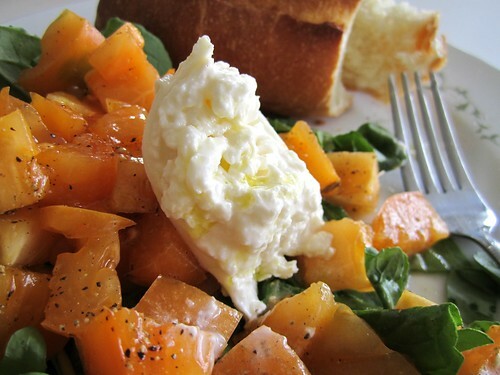 I simply swapped out my usual goat feta for one ounce of burrata. I also added a few drops of black truffle oil to my dipping plate which took it to a new level! Hope everyone had a fabulous holiday weekend. Here’s to a short week! 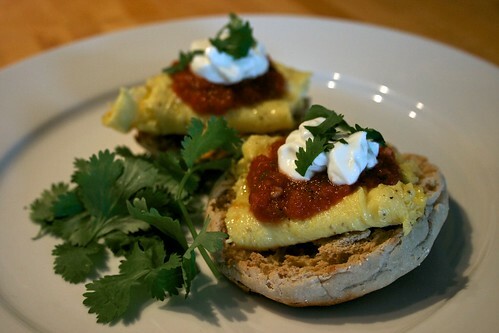 Here’s a quick and easy healthy breakfast option with Mexican flair. The only thing missing, in my opinion, is mashed avocado. It would add a nice creaminess to the sandwich, and it would make it even more filling. As a matter of fact, I added a few slices of avocado while I was eating this! 1/2 avocado, mashed on top your toasted muffin. 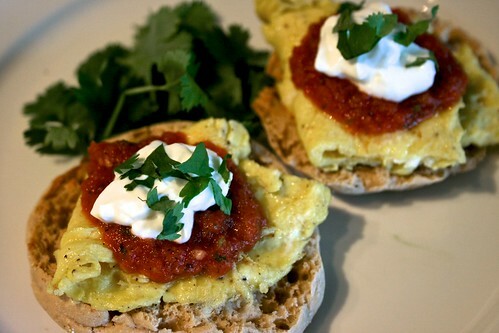 And the calorie count for this breakfast is… drumroll please… 220 calories! You’re looking at about 360 calories if you add the mashed avocado. Either way, you’ve got a low calorie, high fiber, high protein start to your day! If you serve without avocado, add some fresh seasonal fruit. You’ll have the energy to tackle your day full-force! Enjoy your weekend! Summer is quickly coming to a close. I really love eggs. They are so satisfying and a great thing to eat first thing in the morning if you know you’ll be eating a late lunch. 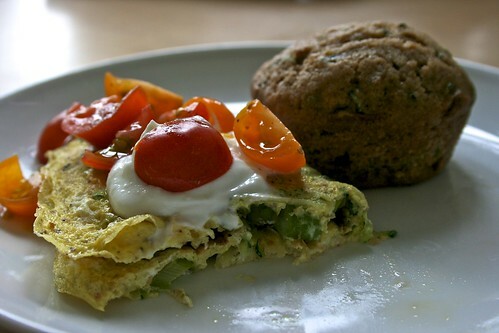 Generally, I only eat one egg for breakfast, but I’ll beef it up with veggies and maybe some nice goat cheese. It’s amazing how full I stay from one little egg. 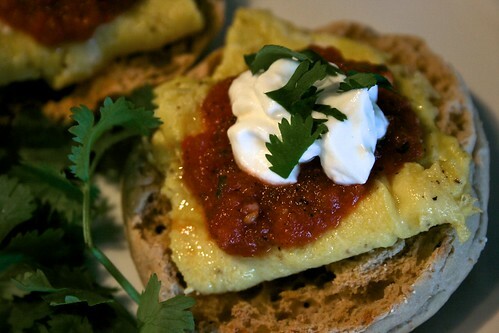 Here’s a simple, but very tasty little omelette. Simply chop asparagus in small pieces and saute over medium high heat in a little olive oil. When asparagus is almost done, grate in some zucchini. After a minute or two, pour in your scrambled, seasoned egg. Gently push edges of the egg up all around the pan allowing the runny egg to flow underneath. Continue to cook until almost set. Flip once. Fold it. Plate it. Top with a dollop of light sour cream, halved baby heirloom tomatoes and a little kosher salt and pepper. Voila! Quick and easy breakfast. 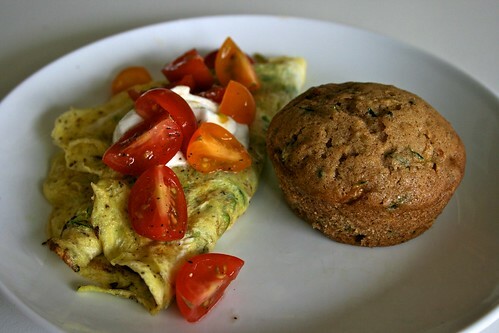 Serve with a yummy zucchini muffin from SimplyRecipes.com and you’ve successfully made two dishes with one of summer’s most bountiful crops! 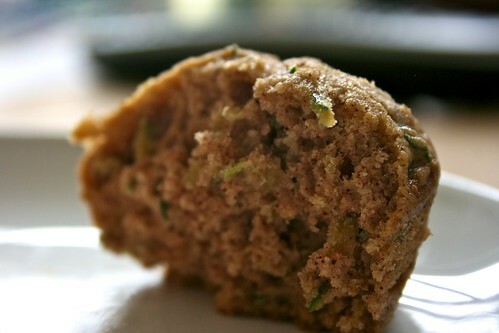 Those zucchini muffins are so very tasty.